Purpose: Review published studies to investigate the value of clinical 3-deoxy-3- 18 F-fluorothymidine (FLT) positron emission tomography (PET) in predicting response to treatment. Materials and Methods: Interrogate databases to identify suitable publications between 2007 and 2013 with a minimum of five patients. Articles within the inclusion criteria were reviewed with major findings reported leading to a descriptive analysis of FLT PET in therapy response. Results: Lesions investigated included glioma, head and neck, esophageal, lung, breast, gastric, renal, rectal, sarcomas, germ cell, lymphomas, leukemia, and melanoma resulting in a total of 34 studies analyzed. A variety of therapies were applied and dissimilar PET protocols were widespread making direct comparison between studies challenging. Though baseline, early and late therapy scans were popular particularly in chemotherapy regimes. Most studies investigated showed significantly reduced FLT uptake during or after therapy compared with pretreatment scans. Conclusion: Current evidence suggests FLT PET has a positive role to play in predicting therapy response especially in brain, lung, and breast cancers where good correlation with Ki-67 is observed. However, careful attention must be placed in undertaking larger clinical trials where harmonization of scanning and analysis protocols are strictly adhered to fully assess the true potential of FLT PET in predicting response to treatment. Introduction: Metronomic chemotherapy (MC) is a novel therapeutic variation for resistant cancers, wherein chemotherapeutic drugs are administrated in low doses with no prolonged drug-free break. It lessens the level of toxicity, is better tolerated and enhances the quality of life. This retrospective analysis was undertaken to evaluate whether anatomical (computed tomography [CT]) or functional (positron emission tomography [PET]) imaging be used for response assessment in patients on MC. Materials and Methods: A total of 16 males and 27 females with age range of 12-83 years on MC who underwent PET/CT were assessed by new response evaluation criteria in solid tumors (RECIST 1.1) and PET response criteria in solid tumors (PERCIST 1.0). Results: Concordance between RECIST 1.1 and PERCIST was seen in 32 (75%) patients. There was discordance in 11 (25%) patients. In patients with discordance, the results were confirmed by follow-up imaging. PET upstaged the disease in 81% of patients (9/11) and down-staged the disease in 19% of patients (2/11). Conclusions: Metabolic response accurately identified the disease status as assessed by clinical or imaging follow-up. Alteration in morphology takes time to manifest, which is demonstrated by CT or magnetic resonance; whereas in MC which brings about tumor dormancy, assessing metabolic response by PET would be more appropriate. MC is usually given in palliative setting but in few cases complete metabolic response was demonstrated in our study. In such a scenario this form of treatment has the potential to become an adjunct mode of treatment in some tumors. This needs to be evaluated with larger, homogenous patient population in a prospective mode. Introduction: Although single-photon emission computed tomography (SPECT)/computed tomography (CT) plays a major role in the characterization of equivocal lesions on bone scintigraphy, it remains equivocal in a fraction of these patients. We evaluated the additional value of cocktail F-18 sodium fluoride (18F-NaF) and F-18 fluorodeoxyglucose (18F-FDG) co-injection positron emission tomography (PET) (cocktail PET) in these patients. Materials and Methods: Fifteen breast cancer patients, who had equivocal findings on the whole body bone scan (WBS) and SPECT/CT, were subjected to a cocktail PET/CT scan. 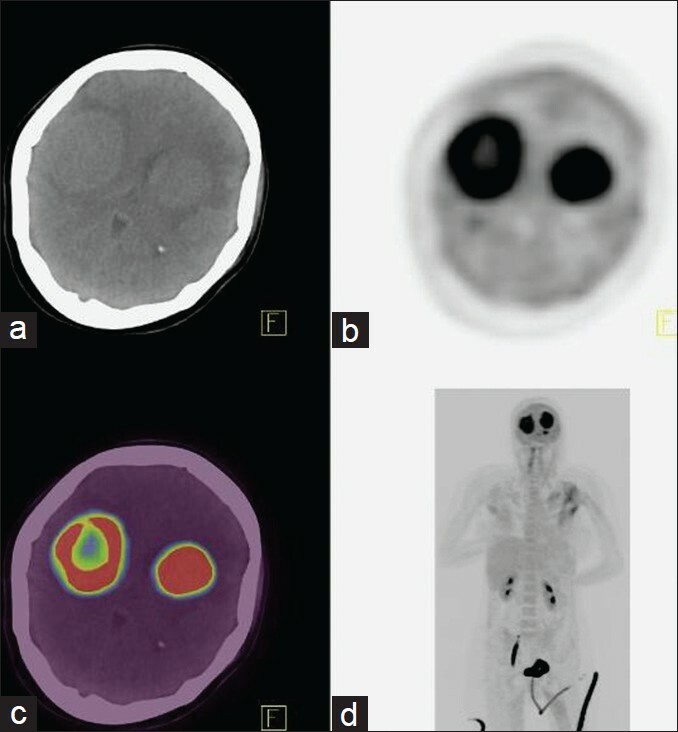 The cocktail PET/CT was performed by co-administration of 18F-FDG and 18F-NaF in a ratio of about 2.4, with the total administered activity kept at approximately 10 mCi. Results: Of the 15 patients, seven were with locally advanced breast cancer (LABC) and the other eight were referred because of suspicion of recurrent disease on follow-up. 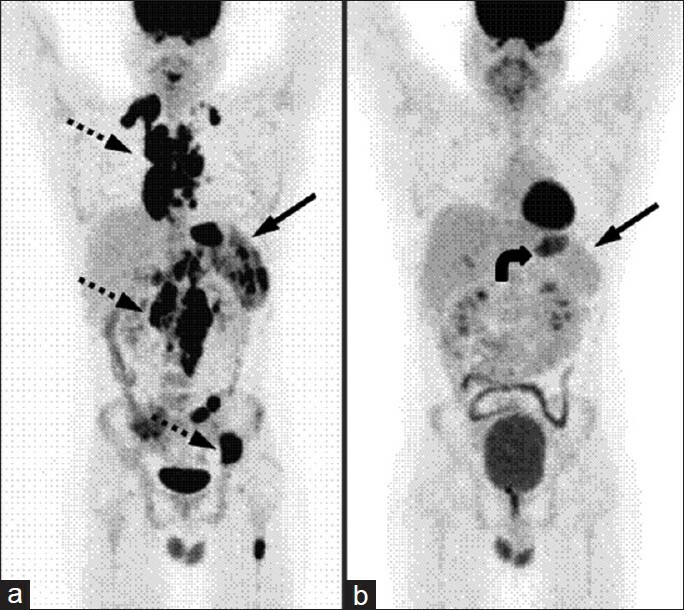 Of the seven patients with LABC, the cocktail PET scan was positive for all the lesions suspicious on WBS and SPECT/CT. Additionally, it showed uptake in the primary tumor and ipsilateral axillary lymph nodes as well as identified additional osseous, lymph nodal, and solid organ metastases in these patients. Similarly, of the eight patients studied for suspicion of recurrence, the cocktail PET scan was found to be positive in seven patients. In three patients, additional osseous lesions were noted. Conclusion: The cocktail PET/CT scan can characterize almost all the suspicious equivocal lesions on the bone scan and SPECT/CT. The distinct advantage of identifying lymph nodal and solid organ metastases allows it to be considered as a useful imaging modality in patients with equivocal bone SPECT/CT. Objective: The aim of this study was to investigate the variability in the interpretation of parenchymal abnormalities and to assess the differences in interpretation of routine renal scintigraphic findings on posterior view of technetium-99m dimercaptosuccinic acid (pvDMSA) scans and parenchymal phase of technetium-99m mercaptoacetyltriglycine (ppMAG3) scans by using standard criterions to make standardization and semiquantitative evaluation and to have more accurately correlation. 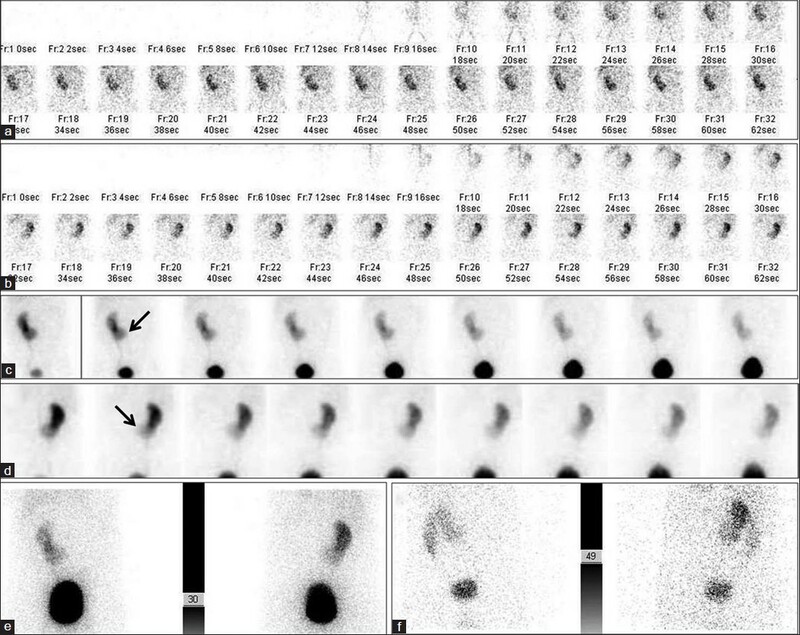 Materials and Methods: Two experienced nuclear medicine physicians independently interpreted pvDMSA scans of 204 and ppMAG3 scans of 102 pediatric patients, retrospectively. Comparisons were made by visual inspection of pvDMSA scans, and ppMAG3 scans by using a grading system modified from Itoh et al. According to this, anatomical damage of the renal parenchyma was classified into six types: Grade 0-V. In the calculation of the agreement rates, Kendall correlation (tau-b) analysis was used. Results: According to our findings, excellent agreement was found for DMSA grade readings (DMSA-GR) (tau-b = 0.827) and good agreement for MAG3 grade readings (MAG3-GR) (tau-b = 0.790) between two observers. Most of clear parenchymal lesions detected on pvDMSA scans and ppMAG3 scans identified by observers equally. Studies with negative or minimal lesions reduced correlation degrees for both DMSA-GR and MAG3-GR. Conclusion: Our grading system can be used for standardization of the reports. We conclude that standardization of criteria and terminology in the interpretations may result in higher interobserver consistency, also improve low interobserver reproducibility and objectivity of renal scintigraphy reports. 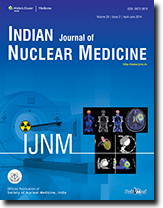 Fluorodeoxyglucose-positron emission tomography/computed tomography (FDG PET/CT) has proven useful in the diagnosis, staging, and detection of metastasis and posttreatment monitoring of several malignancies in human immunodeficiency virus (HIV)-infected patients. It also has the ability to make the important distinction between malignancy and infection in the evaluation of central nervous system (CNS) lesions, leading to the initiation of the appropriate treatment and precluding the need for invasive biopsy. We report an interesting case of HIV positive 35-year-old woman presented with headache, disorientation, and decreased level of consciousness. She underwent whole body PET/CT which showed multiple lesions in the cerebrum which mimics bilateral eye in brain. A diagnosis of a primary CNS lymphoma was made and patient was started on chemotherapy. Thyroid lymphoma is a rare disease entity of elderly females. Chronic lymphocytic thyroiditis is said to be the precursor of thyroid lymphoma, suggesting a role of chronic antigen stimulation in the development of the disease. We present a case of male with lymphocytic thyroiditis who presented with painless progressive neck enlargement and pathology revealed features of high grade lymphoma. Staging and posttreatment 18 F-fluorodeoxyglucose ( 18 F-FDG) positron emission tomography/computed tomography (PET/CT) was performed. 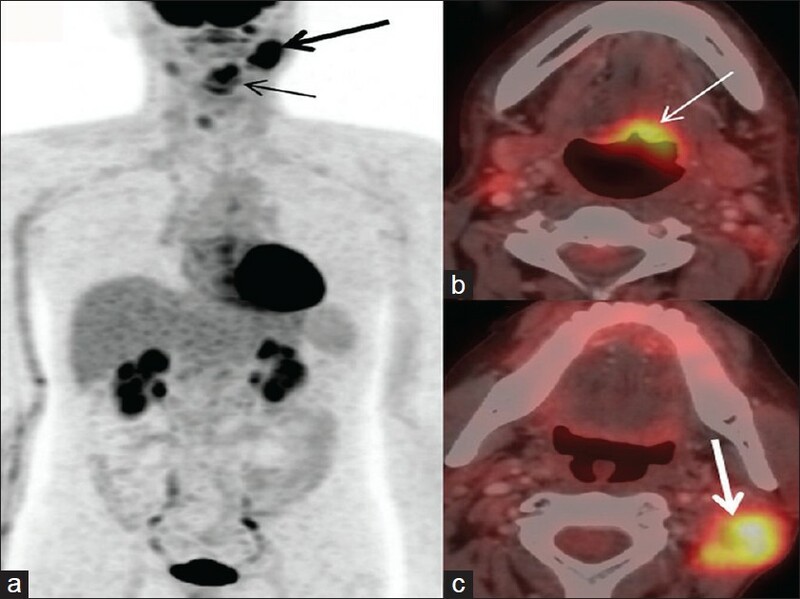 This report reemphasizes the role of 18 F-FDG PET/CT in the diagnosis, staging, and assessment of therapy response in patients with extranodal lymphoma, including the primary thyroid lymphoma. Differentiated thyroid cancer frequently metastasizes but generally spreads to regional cervical lymph nodes and, in advanced cases, to the lungs and/or skeleton. Metastases to the skin/subcutaneous tissue are rare. We report 45-year-old male patient presented with a loin swelling which on biopsy showed a papillary carcinoma and referred for fluorodeoxyglucose-positron emission tomography/computed tomography (FDG PET/CT) to find out the primary disease. 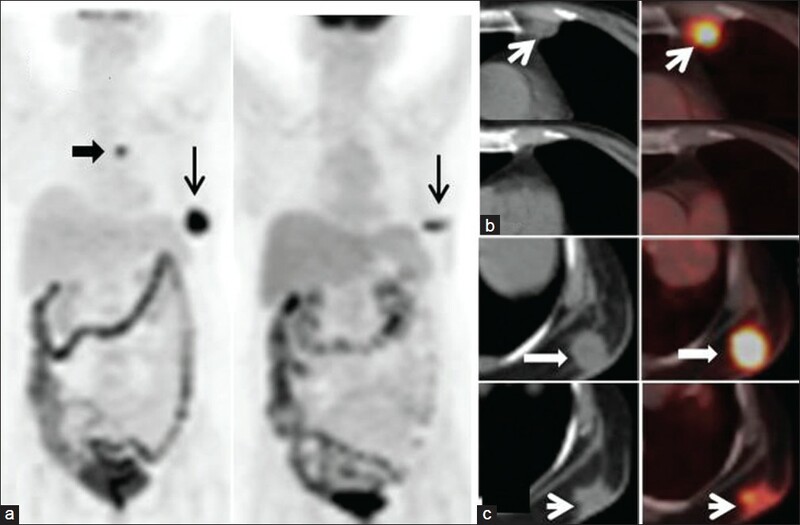 PET/CT showed abnormal FDG uptake within a loin metastasis and right lobe thyroid nodule. Fine-needle aspiration from nodule showed papillary carcinoma. Because thyroid cancer can rarely metastasize to the skin, attention should be given to that region during interpretation of the images. He was advised total thyroidectomy and metastasis excision. Tuberculosis (TB) has aptly been called the great mimicker. 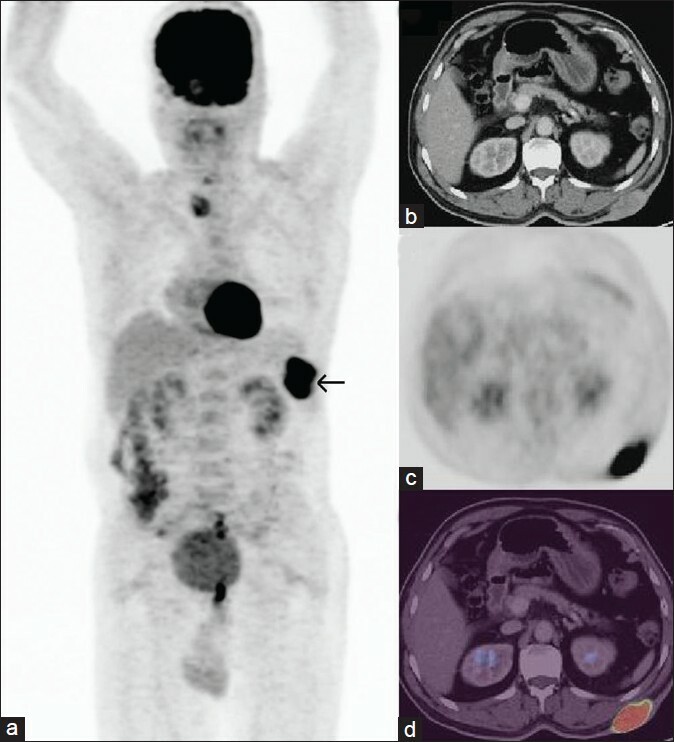 A 14-year-old boy, who had been treated for Hodgkin's Lymphoma 2 years back and had been in remission, underwent a whole body 18F-fludeoxyglucose positron emission tomography/computed tomography (18F-FDG PET/CT) scan, owing to a recent onset of backache and difficulty in walking. The study showed an FDG avid destructive lesion of the posterior elements of the sixth, seventh and eighth dorsal vertebrae along with a hypermetabolic collection in the adjacent paraspinal muscles with extension into the spinal canal, causing encasement of the thecal sac as well. Based on this constellation of findings, a diagnosis of atypical spinal TB was made, which was subsequently proven on histopathology. The present case illustrates that spinal TB, including the atypical form can be diagnosed on PET/CT even in clinically unsuspected cases. 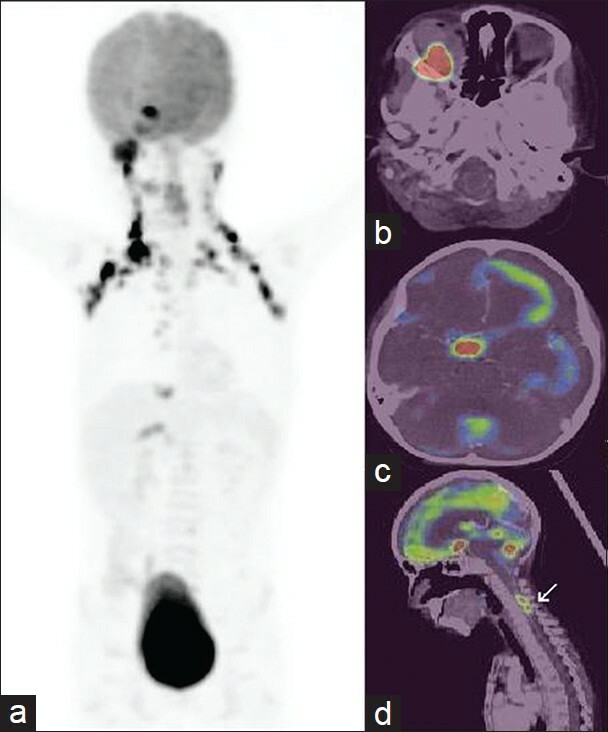 18 Flurodeoxyglucose ( 18 F-FDG) positron emission tomography/computed tomography (PET/CT) is nowadays routinely used in management of lymphoma patients. We here present a case of Hodgkin's lymphoma which showed 18 F-FDG avid splenomegaly on PET/CT done for clinically suspected relapse. Further evaluation by peripheral smear examination revealed malaria. 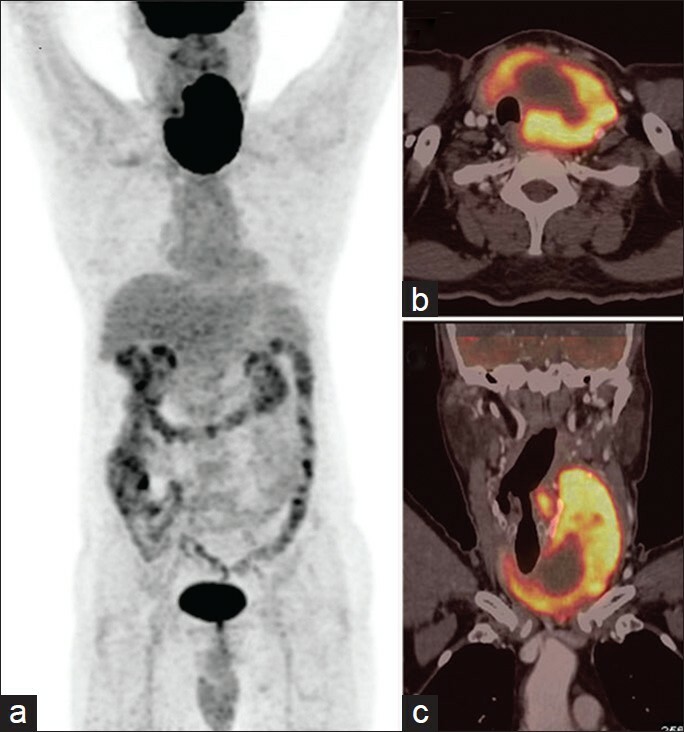 The patient was then started on anti-malarial medications and follow-up PET/CT revealed resolution of hypermetabolic splenomegaly. This report highlights that in endemic regions malaria can cause 18 F-FDG avid splenomegaly and might mimic relapse of lymphoma. Ectopic thyroid tissue (ETT) refers to the presence of thyroid tissue in locations other than the normal anterior neck region between the second and fourth tracheal cartilages. Multiple ectopia of the thyroid is extremely rare. 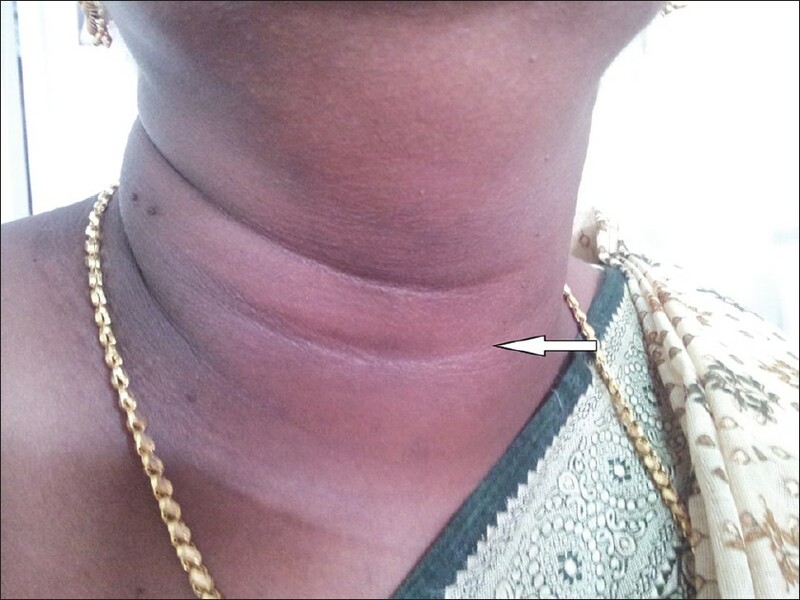 Here we report a case of 10-year-old girl with anterior midline neck swelling and hypothyroidism with dual ectopia of thyroid gland without orthotopic thyroid gland. Planar 99 m-technetium pertechnatate scan identified ETT corresponding to the palpable neck swelling. Single photon emission computed tomography/computed tomography (SPECT/CT) demonstrated ETT in two locations, one corresponding to the palpable mass and another in the in the sublingual location. This case thus demonstrates the important role of hybrid SPECT/CT in the identification of dual ectopia along the thyroglossal tract. A 70-year-old female patient presented to her primary care doctor with persistent elevated alkaline phosphatase of suspected metastatic etiology. Computed tomography demonstrated epicardial and peritoneal nodules. Biopsy of one of the peritoneal nodules revealed thyroid tissue and extraovarian struma ovarii was considered. The patient had a history of remote total abdominal hysterectomy and bilateral salpingo-oophorectomy 31 years prior for endometriosis with no available pathology from that surgery. The patient recalls being told that she had a left ovarian cyst. A thyroid ultrasound was performed that demonstrated multiple nodules without concerning features; however, due to high clinical suspicion, a total thyroidectomy was performed. Upon full histological evaluation a 0.5 cm papillary microcarcinoma was found. Given the rarity of metastatic papillary cancer to the peritoneum and the small size and grade of the tumor, a diagnosis of highly differentiated follicular carcinoma of ovarian origin was favored. 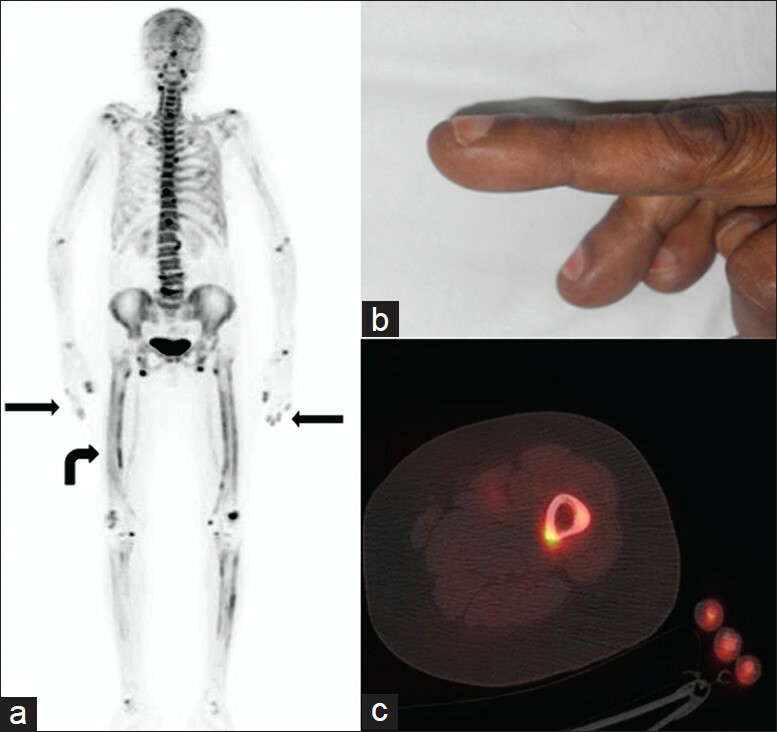 The patient was subsequently treated with radioiodine therapy. Pediatric myocardial perfusion imaging (MPI) is not a routine investigation in an Indian setting due to under referrals and logistic problems. However, MPI is a frequently performed and established modality of investigation in adults for the identification of myocardial ischemia and viability. 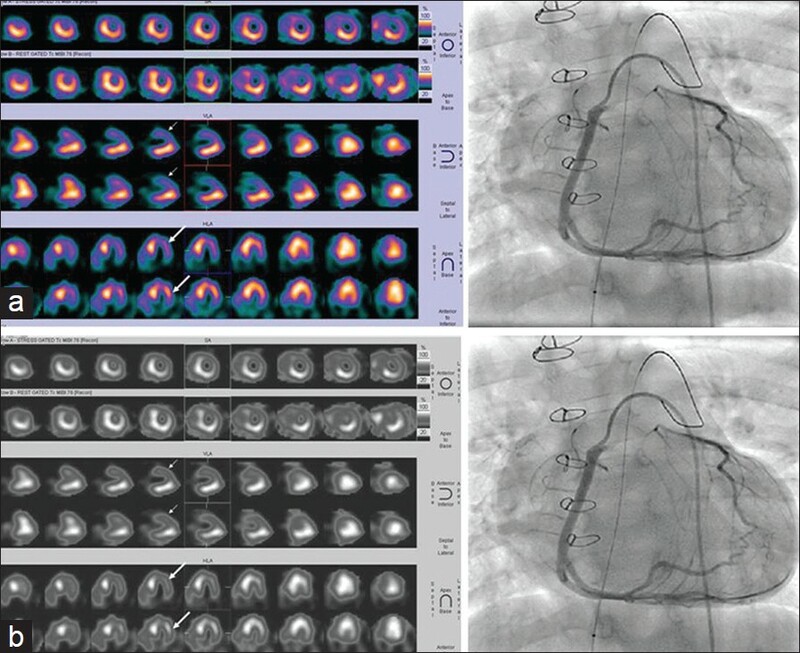 We report myocardial perfusion scintigraphy in a case of retropulmonary looping of left coronary artery in a baby after arterial switch surgery. Adenosine stress MPI revealed a large infarct involving anterior segment with moderate reversible ischemia of the lateral left ventricular segment. Coronary angiogram later confirmed left main coronary artery ostial occlusion with retrograde collateral supply from dilated right coronary artery. Trilateral retinoblastoma (TRb) is a rare syndrome associating hereditary bilateral or unilateral retinoblastoma (Rb) with an intracranial neuroblastic tumor. The latter arises in the midline, most often in the pineal gland, less frequently in the suprasellar or parasellar region. The outcome is usually fatal because of secondary spinal dissemination. We report 10-year-old boy presented with a right eye proptosis and leukocoria, and the magnetic resonance imaging (MRI) showed right orbital mass lesion infiltrating optic nerve and diagnosis of retinoblastoma was made. 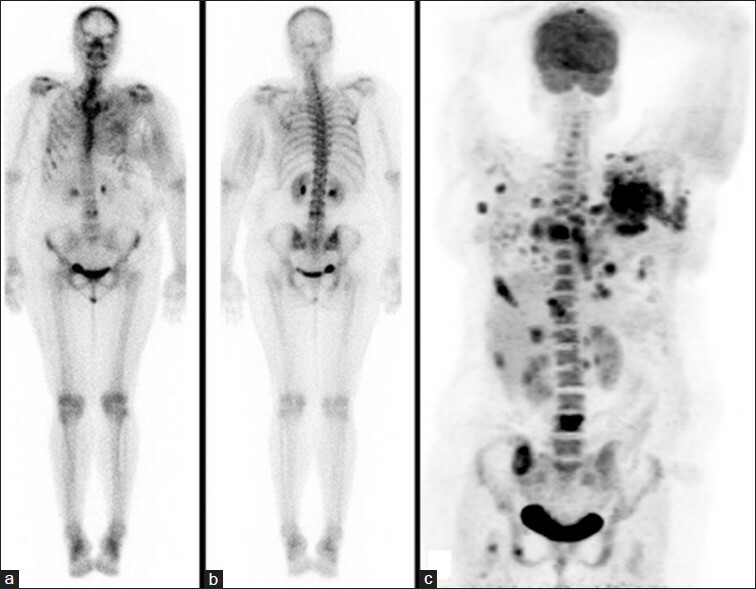 He was referred for fluorodeoxyglucose-positron emission tomography/computed tomography (FDG PET/CT) to find out the extent of the disease. PET/CT showed abnormal FDG-uptake within right orbital mass lesion, suprasellar enhancing lesion and drop metastasis in the cervical spinal canal level. He was diagnosed as a case of TRb with spinal canal drop metastasis. He underwent chemotherapy and craniospinal irradiation. The 'horseshoe kidney' is the most common renal fusion anomaly. In this disorder, two developed kidneys are connected to each other at the lower part and grow together. We report a case of horseshoe kidney mimicking cross-fused ectopia in 99m Tc-EC renal dynamic scintigraphy. Hypertrophic pulmonary osteoarthropathy is manifested by clubbing and periostitis of bones. We present a very rare documentation of increased F18-sodium fluoride uptake in the distal phalanges of both hands correlating to clubbing of the fingers in a 55-year-old female patient with carcinoma of lung in whom bone positron emission tomography was performed for metastatic work-up. 68 Ga-labelled [1, 4, 7, 10-tetraazacyclododecane-1, 4, 7, 10-tetraacetic acid]-1-NaI3-Octreotide ( 68 Ga-DOTANOC) positron emission tomography/computed tomography (PET/CT) is an excellent modality in patients with carcinoma of unknown primary of neuroendocrine origin. Most of the primary lesions are located in mid gut region where the lesions have poor resolution due to undistended and overlapping intestinal loops and motility-related artifacts. Although PET/CT enteroclysis, enterography and colonography have been described with 18 F-fluorodeoxyglucose, PET/CT enterography with 68 Ga-DOTANOC has not been described in the literature. 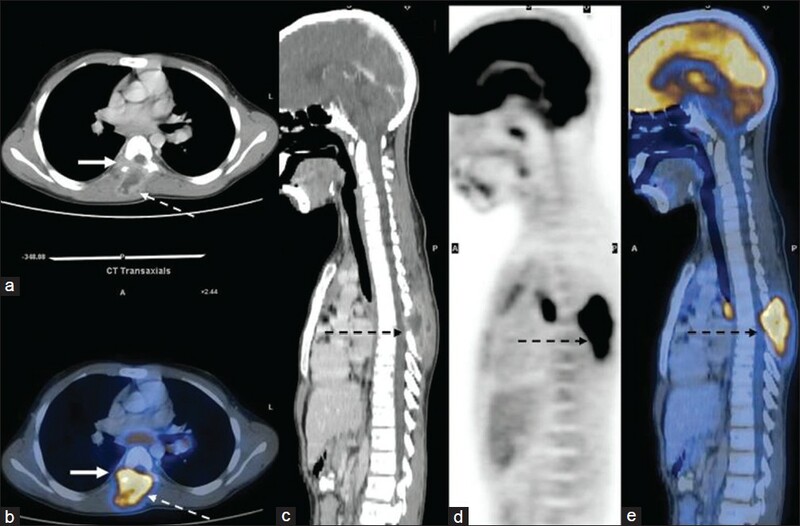 Here, we present a case where 68 Ga-DOTANOC PET/CT enterography was useful in identifying the primary neuroendocrine tumor lesion in small intestine with accurate delineation.